Gmelius makes possible to share an inbox and automatically synchronize conversations sent to a specific email address. Let's suppose you want to share with members of your team emails sent to your support email address, support@acme.com. Here is a short step-by-step guide. First ensure that Gmelius is active for the intended to share email address, e.g., support@acme.com. If not, just sign up using the latter account by heading to https://gmelius.io/signup. Once Gmelius is linked to your primary account, add it to your Gmelius Business subscription. You'll then be able to configure a shared inbox. 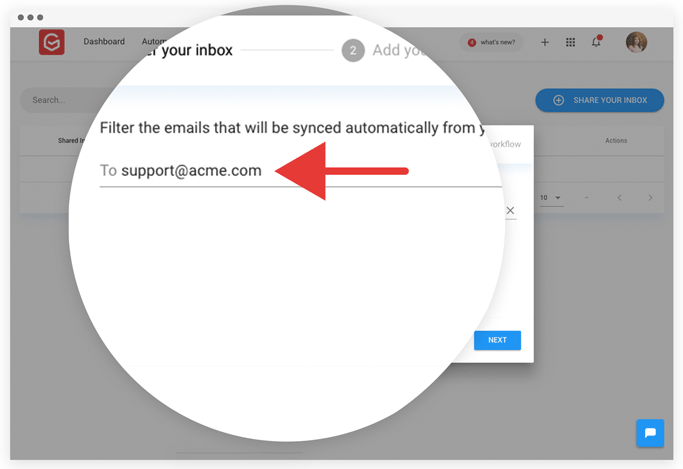 To do so, head to https://gmelius.io/shared-inbox being signed with the primary email address you want to share (in our case support@acme.com). Create a new shared inbox rule by clicking on the large blue button at the top of the page. 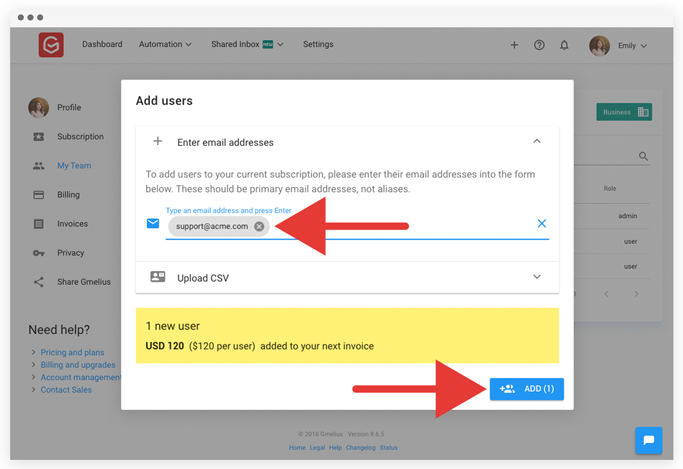 Select the email address you want to sync your inbox with, your current email address will be selected by default. 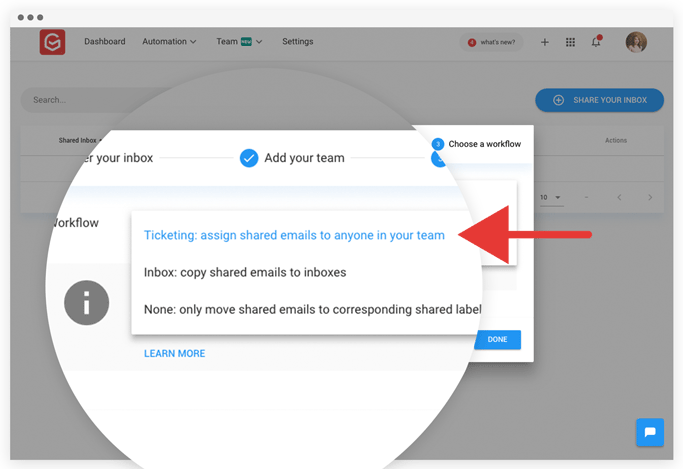 If you have other emails (e.g., from an alias) arriving in your inbox, select the email address from which you need to share automatically all emails. Pick the email addresses of the people you want to share the inbox with. Ensure those have been added to your Business (Legacy plan),Team or CRM subscription previously. First, ensure that Gmelius is active for the primary account (e.g., jane.smith@acme.com) that has the configured alias (e.g., support@acme.com) you wish to share. Also, ensure this primary account has a Gmelius Business subscription. 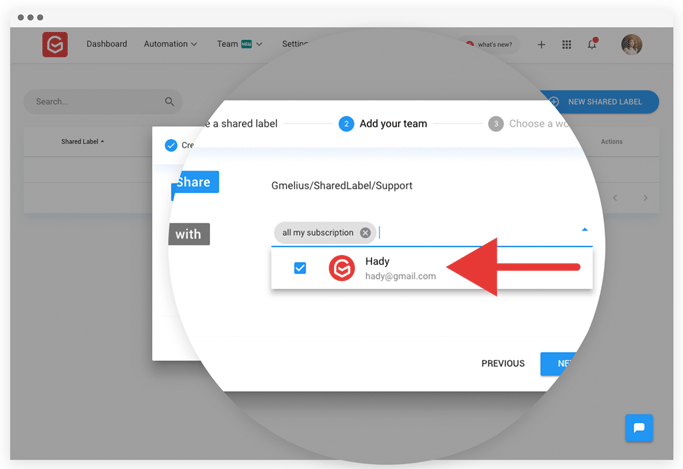 Then, head to https://gmelius.io/shared-labels being signed with the primary email address which controls the alias. 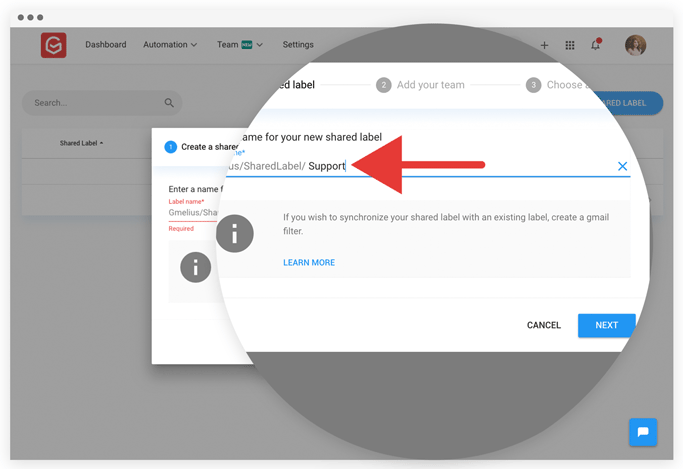 Create a shared label rule by clicking on the large blue button at the top of the page. 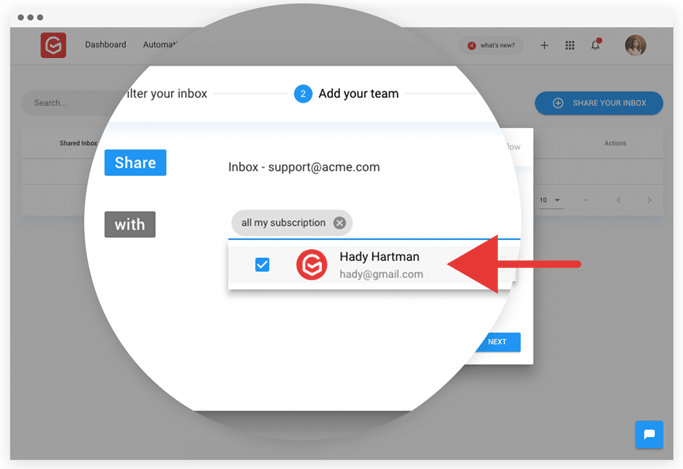 Enter a name to identify the shared inbox (label) e.g., "Support"
Pick the email addresses of the people you want to share the inbox with. Ensure those have been added to your Team or CRM (applies to Business legacy plan) subscription previously. Finally, choose a workflow. 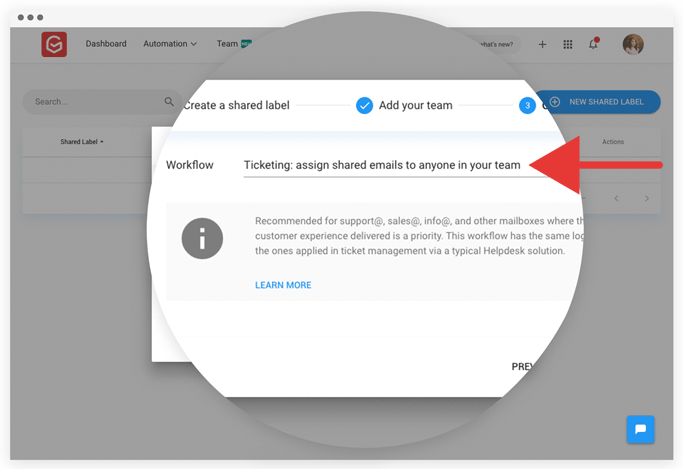 We recommend the "Ticketing" workflow. For more information on the available Workflows, please see this article. Go back to Gmail and reload your inbox. 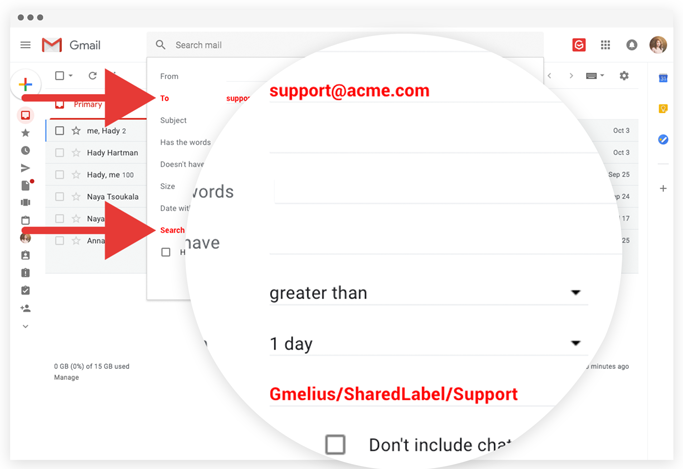 In our case, the Gmail filter should be "To:support@acme.com", then apply the Label: "Gmelius/SharedLabel/Support"